Want to see what else has been frequently banned in the United States last year? Check out the ALA's top ten list. Then maybe get really crazy and read one of those books. I've only read five - I just put myself on the wait list for Craig Thompson's Habibi, which sounds fantastic. I've really been a fan of graphic novels lately, too - they're not your parents' comic book adaptations! Finally, see how deep your banned book knowledge is with this quiz from the New York Public Library. No excuses...it's only six questions long! 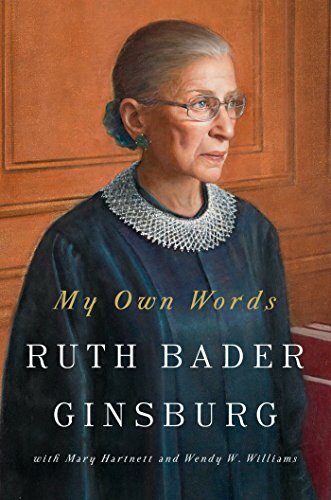 I'm so excited about Ruth Bader Ginsburg's upcoming release, My Own Words, that I've already pre-ordered it twice. Oops. Thanks for watching my back on that one, Amazon. Knowing me, I'll probably try to pre-order it at least one more time. It's set for release on October 4. If you're a contemporary fiction fan like I am, then you'll be excited to check out this list of highly anticipated second half 2016 publications from The Millions! Organized by month. And no Quick Pick would be complete without my absolutely famous book reviews by hashtag! These books creeped me out a little this year. The spooky season is upon us, right? The Pesthouse by Jim Crace: #postapocalypticAmerica #goeastyoungman #ornot #bridgesarentwhattheyseem #whatthehellhappened? Still looking for books? You're a nut. Check out the 2017 long lists for Andrew Carnegie fiction and non-fiction awards. I guarantee that you'll find at least one title you haven't read yet.